Frankenstein is currently transplanting brains in Warner Bros. 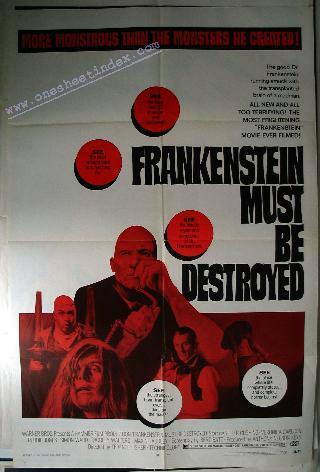 Seven Arts' latest terror feature, "Frankenstein Must Be Destroyed," which opened in 1969. The latest of the highly popular series stars Peter Cushing, making his fifth appearance as Frankenstein, Virginia Carlson, Simon Ward, Freddie Jones, Thorley Walters and Maxine Audley. Most of the filmmakers involved with past Frankenstein features were on hand for the present chiller, including director Terence Fisher and producer Anthony Nelson Keys.